I’m thrilled and honoured to announce that Steve Gunn & Associates received an Investor in Education Award from the Oxfordshire Business Education Alliance (OBEA). We were nominated by the excellent Lord Williams’s School in Thame. Award recipients were nominated by the IBEA, Lord Williams’s School, Gosford Hill School and Wheatley Park School, and were presented with their awards at a ceremony at The Old Swan and Minster Mill, Minster Lovell, Witney, on Friday 30 June. 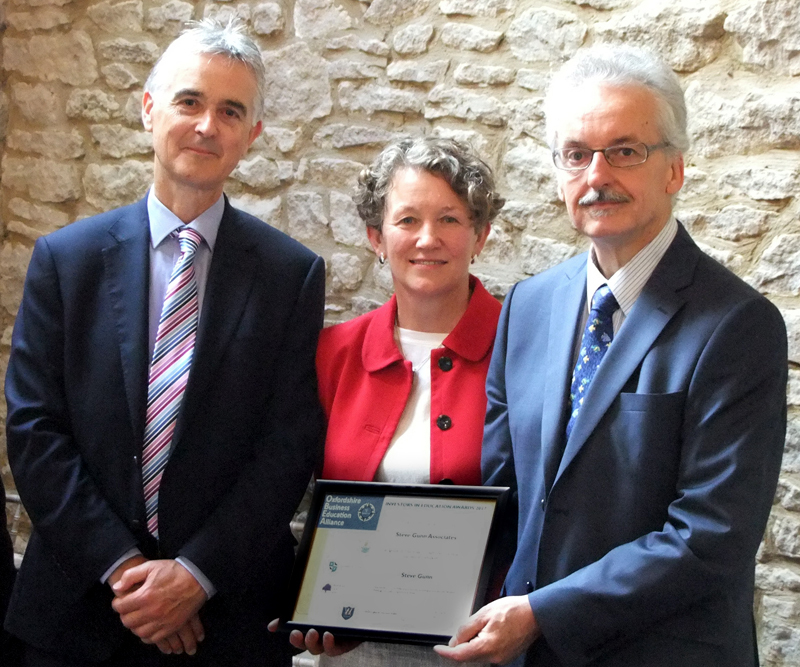 Steve Gunn (right) receives his award from David Wybron, Head of Lord Williams’s School, and Kate Curtis, former Head of Wheatley Park School and now Education Quality Associate for the River Learning Trust. Both of our children benefitted hugely from attending Lord WIlliams’s, and it’s a great feeling to be able to give something back. The school has an excellent personal development curriculum and I’ve had the pleasure of helping out on several activities aimed at helping pupils prepare for the next stages in their lives. First, I helped out with some interview practice sessions. Then I took part in the “human library” project. This is a new initiative that aims to develop career pathway understanding amongst the School’s younger students. It was great fun and also very useful for the pupils, who gave really positive feedback on the activity. Using the library metaphor, local business people, including myself, sat on “the library shelf” (a row of chairs) and Year 8 pupils, divided into groups of five or six, took a person from the library and asked them questions about their working lives. After about eight minutes, they returned the “human” to his or her place on the “library shelf” (their chair) and “loaned” the next “human” from “the shelf” and carried and questioned their new “loan”. I found it absolutely fascinating as well. Some pupils already had very firm ideas about what they wanted to do; others admitted they had no idea yet. The Human Library project helped by demonstrating that careers don’t often take straight paths, and that opportunity and sometimes failure can be the mother of re-invention, and that it doesn’t matter if you don’t really know what you want to do when you’re in Year 8. It’s been really rewarding working with Lord Williams’s School and I look forward to continuing the relationship.